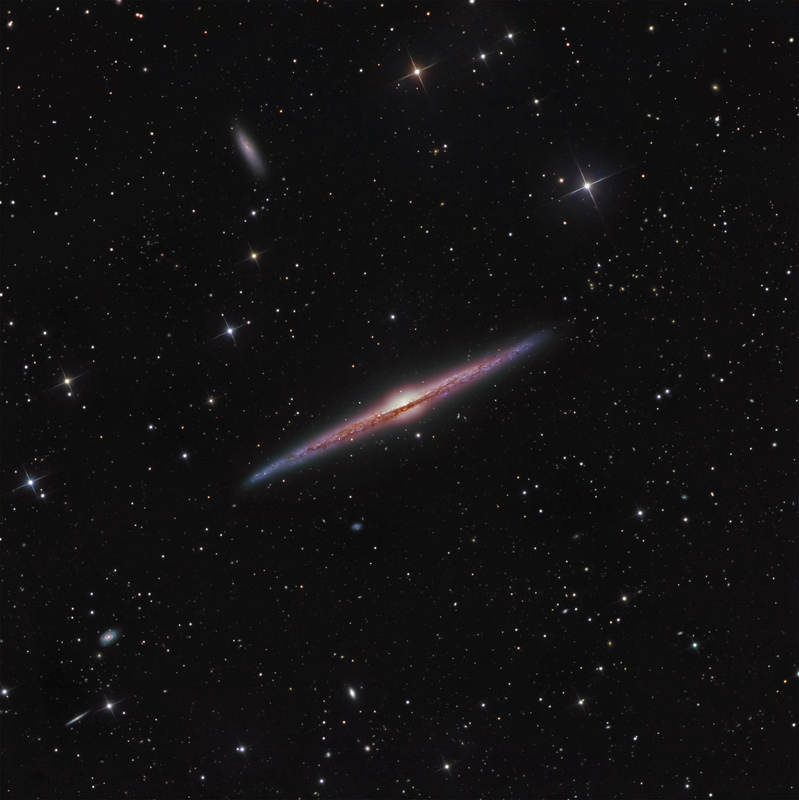 NGC4565 is located in the constellation of Coma Berenices. Often called the Needle Galaxy, it was first discovered by William Herschel in 1785, and is located between 31 & 45 million light years from our own Milky Way galaxy. It is one of the finest edge on galaxies visible to us, and favorite target of amateur astronomers. It has many similarities to our own galaxy in size and mass. From our vantage point, NGC4565 is 100,000 light years across, yet only 3300 light thick. Astronomers think this is how our galaxy would look if we could look at it from the side. The Hubble Space Telescope has photographed many globular clusters around this galaxy, again much like our own galaxy. It contains two luminous X-Ray point sources based upon Chandra and Hubble Space Telescope data. Measurements of the central point source are consistent with NGC 4565 having an active galactic nucleus. The central bulge contains a population of older stars, whereas new star formation can be seen in the spiral arms compressed in our edge-on view. There are numerous larger background galaxies that are annotated in the image below, and many more smaller galaxies throughout the field, which is ~ 40′ x 40′. North is down. The system was guided with an SBIG ST-402 camera on an Astrodon MonsterMOAG off-axis guider. Astrodon Generation 2 LRGB filters were used. Data were collected with CCDAutoPilot4 running Maxim4.62 using PinPoint Pro5 for image links. Data were calibrated with sky flats, darks and biases in CCDStack and further processed in Photoshop CS3.